The Squadra Verde has been tearing round Italy in the Mille Miglia – thanks to John Davies for the regular updates and to the official Web site for round-the-clock time checks. We await a considered report by the participants – We want to hear about dusky Mediterranean maidens, miraculously reinvigorating espressos, ice cream parlours to die for and the many more hallucinations that can be brought on by sleep deprivation and unnatural physical discomfort. Meanwhile the testers were suffering from statistical overload after Wednesday’s last Westerley CC Hillingdon Circuit TT of the season (report here). On Friday the WCC (and half the population of North and West London) were at Hillingdon Cycle Circuit for the Minet Ladies Cycling Club 1,000 lap charity ride. Over 70 riders turned up and we knocked of the 1,000 laps in about 90 minutes. 1,895 laps (that’s over 1,750 miles) were covered in total and hundreds of pounds were raised for a local charity. 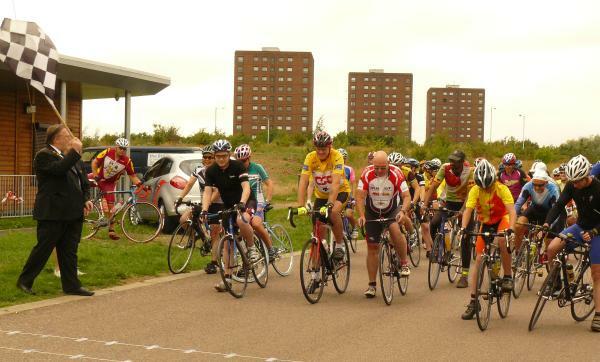 Saturday was the club Track Championships at Welwyn organised by Tony Woodford with help from Steve May. It was a warm, dry afternoon for the eleven participants. After four events Tom London was crowned as men’s champion, Jayne Paine as the women’s champion, Kirsten Savage as under 16 girl’s champion and Connor Woodford as under 16 boys champion. Hat to all the riders. While the be-sequined trackstars were riding round in circles the road squad were… riding round in circles at Hillingdon. No report in yet. Gill Reynolds rode the Team Sanjan 10m TT near Cambridge recording a 25:46 in windy conditions. Fastest on the day was Ashley Cox of Team Corley Cycles in 20:12. Sunday dawned early for Peter Dixon and Joe Foley at the Oxonian ‘50’ near Kingston Bagpuss. In tough conditions Peter came a fine fourth with 1:57:55. Joe did a 2:36:41. The winner was Jesse Elzinga (Beeline Bicycles RT) in 1:52:57. The team bus took the biggest team of the weekend to the Old Crocks’ ‘10’ organised by Hillingdon CC at Great Missenden. 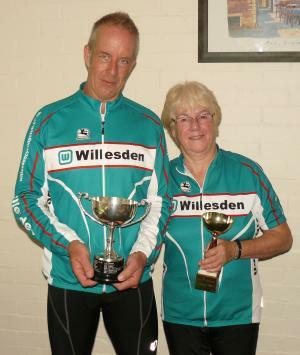 Tim Burrows won the Old Crocks’ Trophy on handicap with a ride of 26:30. Jenny Wright won the Ladies Handicap Trophy with a 40:07. Other rides were: Brian Wright 31:29, Ron Purdy 32:11, Jim McKay 28:17, Alan Gallacher 29:29, and Lance Woodman (private trial) 25:03. Potential new member Chloe Aitken produced a fine debut ride on her road bike of 26:29. It was good to see so many WCC supporters out as well. Fastest on the day was a private trial by Peter Smith of 22:35. This entry was posted in Audax, Charity Rides, Hillingdon Cycle Circuit, Road Racing, Sportives, Time trials, Track. Bookmark the permalink.